Prominent & Leading Manufacturer from Navi Mumbai, we offer cfr a series axial evaporative condensers and cfr c series axial evaporative condensers. We are a well-known name, involved in providing an extensive series of CFR A Series Axial Evaporative Condensers. Our product is extremely employed by customers owing to their sturdy nature. An evaporative condenser, made up of Z725 galvanized sheet metal and axial fans, fulfills the purpose of cooling by using ammonia or gas refrigerants. Easy and cost-efficient transport and installation of sections with no need for exceptional trailer transport. Ideal for industrial use, refrigeration and air conditioning. Food, Automotive, Energy, Chemicals, HVAC, Metallurgical, Industrial. 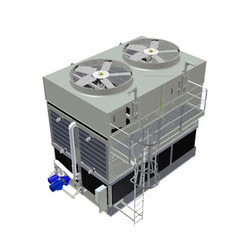 We are involved in delivering a wide series of CFR C Series Axial Evaporative Condensers. Our presented range is available in diverse specifications that meet on client's demand. Evaporative condenser with cover in Z725 sheet steel and centrifugal fans, designed for the condensation of gases such as ammonia or other refrigerant gases. Ideal for uses in industry, refrigeration and air conditioning.